Uses standard 2×10 PIN JTAG connector,can be extended to 14PIN,10PIN ,6PIN through adapter board. JTAG (named after the Joint Test Action Group which codified it) is an industry standard for verifying designs and testing printed circuit boards after manufacture. JTAG implements standards for on-chip instrumentation in electronic design automation (EDA) as a complementary tool to digital simulation. It specifies the use of a dedicated debug port implementing a serial communications interface for low-overhead access without requiring direct external access to the system address and data buses. 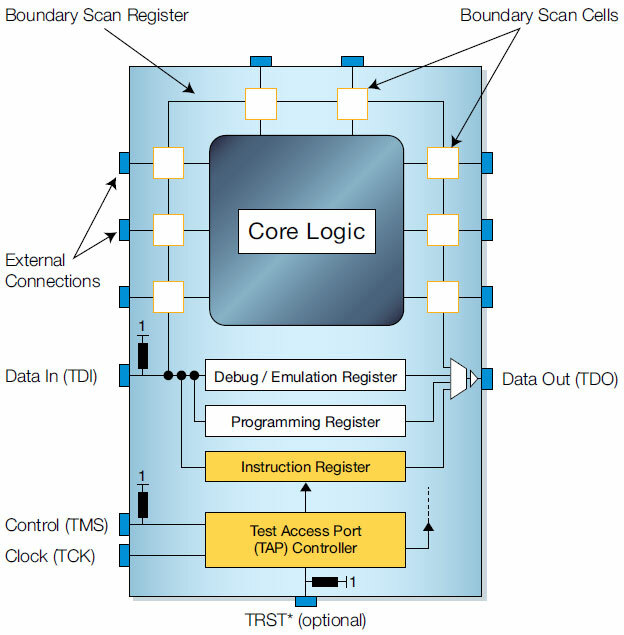 The interface connects to an on-chip test access port (TAP) that implements a stateful protocol to access a set of test registers that present chip logic levels and device capabilities of various parts. The Joint Test Action Group formed in 1985 to develop a method of verifying designs and testing printed circuit boards after manufacture. In 1990 the Institute of Electrical and Electronics Engineers codified the results of the effort in IEEE Standard 1149.1-1990, entitled Standard Test Access Port and Boundary-Scan Architecture. The JTAG standards have been extended by many semiconductor chip manufacturers with specialized variants to provide vendor-specific features. Processors often use JTAG to provide access to their debug/emulation functions and all FPGAs and CPLDs use JTAG to provide access to their programming functions. JTAG is not JUST a technology for processor debug/emulation. JTAG is not JUST a technology for programming FPGAs/CPLDs. The debug and programming tools commonly associated with JTAG only make use of one aspect of the underlying technology – the four-wire JTAG communications protocol. These four signals, collectively known as the Test Access Port or TAP, are part of IEEE Std. 1149.1. This standard was developed to provide a technology for testing Printed Circuit Board Assemblies (PCBAs) without needing the level of physical access required for bed-of-nails testing or the amount of custom development needed for functional test. The TAP was designed to interact with new registers that were added to devices to implement this method of testing. Very quickly however silicon manufacturers recognised the benefits of using the TAP to access registers offering other functionalities such as debug and programming. The main register added to a device specifically for JTAG testing is called the Boundary Scan Register (BSR). As its name suggests the individual bits, or cells, of this register are at the boundary of the device, between its functional core and the pins or balls by which it is connected to a board – very often JTAG testing is referred to as boundary scan. Boundary scan cells (see above) can operate in two modes. In their functional mode they have no effect on the operation of the device – this is the mode in which they operate when the board is running normally. In their test mode they disconnect the functional core of the device from the pins. By putting boundary scan cells into test mode they can be used to control the values being driven from an enabled device onto a net and also be used to monitor the value of that net. Disconnecting the control of the pins from the functionality of the enabled device makes boundary scan test development significantly easier than traditional functional test as no device configuration or booting is required to use the pins. By providing a mechanism to control and monitor all the enabled signals on a device from a four-pin TAP, JTAG significantly reduces the physical access required to test a board. There are two main ways that this boundary scan capability can be used to test a board. The first way, connection testing (see next section) gives good test coverage, particularly for short circuit faults. It is based purely on the JTAG device capabilities, the connections and nets on the board and – in the case of XJTAG – the logic functionality on a board. The second way extends this coverage by using the JTAG enabled devices on a board to communicate with non-JTAG peripheral devices such as DDR RAM and flash. There is a maximum of five lines that may be used for a JTAG interface, although one of them is optional and therefore may not always be present. This may be the case when the design becomes short of pins on a connector and the optional one can be sacrificed. TCK - Test Clock: The test clock pin on the JTAG interface is the clock signal used for ensuring the timing of the boundary scan system. The Test Clock is used to load the test mode data from the TMS pin, and the test data on the TDI pin on the rising edge. On the falling edge test clock outputs the test data on the TDO pin. It is important that the clock line is properly terminated to prevent reflections that may give rise to false triggering and incorrect operation of the JTAG interface. TDI - Test Data Input: The TDI pin on the JTAG interface or JTAG connector is the connection onto which the test instructions data stream is passed. It receives serial input data which is either feed to the test data registers or instruction register, dependent upon on the state of the TAP controller. The TDI line has an internal pull-up, and therefore the input is high with no input. TDO - Test Data Output: This pin within the JTAG interface provides data from the boundary scan registers, i.e. test data shifts out on this pin. It delivers serial data which comes from either the test data registers or instruction register, dependent upon on the state of the TAP controller. Data applied to the TDI pin will appear at the TDO pin but may be shifted by a number of clock cycles, depending on the length of the internal register. The TDO pin has a high-impedance. TMS - Test Mode Select: This input on the JTAG interface also clocks through on the rising edge of TCK determines the state of the TAP controller. It controls the operation of the test logic, by receiving the incoming data. The value at the input on the rising edge of the clock controls the movement through the states of the TAP controller. The TMS line has an internal pull-up, and therefore the input is high with no input. TRST - Test Reset: This is an optional active low test reset pin on the JTAG interface. It permits asynchronous TAP controller initialization without affecting other device or system logic. The TRST signal is usually asynchronous, but not always so dependent upon the particular device in question. If a TRST connection is not available, then the test logic can be reset by using TCK and TMS in a synchronous fashion. Note that resetting test logic does not imply resetting other circuits: there are generally processor-specific JTAG operations which are able to reset all or part of the device being tested. What is a JTAG connection test? A JTAG connection test will check that the connections around the JTAG enabled devices on a board are the same as those specified in the design. Where two JTAG enabled pins are meant to be connected the test will make sure one pin can be controlled by the other. Where enabled pins are not meant to be connected they are tested for short circuit faults by driving one pin and checking that these values are not read on the other pins. Missing pull resistors and ‘stuck-at’ faults can also be found by a connection test as well as faults involving logic devices whose behaviour can be described in a truth table. XJTAG will automatically generate the vectors required to run a connection test based on the netlist of a board and JTAG information for the enabled devices. What about devices that are not JTAG enabled? While the main devices, such as processors and FPGAs, are normally JTAG enabled, there will be many devices in every design that are not. DDR, SDRAM, SRAM, flash, MDIO controlled Ethernet PHYs, SPI and I2C temperature sensors, real time clocks, ADCs and DACs are just some examples of such devices. The connection test will still provide excellent coverage for short circuit faults on the nets linking these non-JTAG devices to JTAG enabled devices; however it cannot check for open circuit faults at either the JTAG device or the non-JTAG device. In order to add this open circuit coverage it is necessary to communicate with the peripheral device from boundary scan on the enabled device. If communication can be verified, there cannot be an open circuit fault. This type of testing can be very simple, for example lighting an LED and asking an operator to verify it has activated, or more complex, for example writing data into the memory array of a RAM and reading it back. Is it a lot of work to create a JTAG test system? Using the libraries for standard non-JTAG components provided by XJTAG, you can get a set of tests up and running for your board with no code development. The library files contain models for all types of non-JTAG devices from simple resistors and buffers to complex memory devices such as DDR3. Because boundary scan disconnects the control of the pins on JTAG devices from their functionality the same model can be used irrespective of the JTAG device controlling a peripheral. Most boards already contain JTAG headers for programming or debug so there are no extra design requirements. Where do I get information about the JTAG in my devices? In order to run any boundary scan based testing it is necessary to have some information about the implementation of JTAG on the enabled devices on a board. This information comes from the BSDL (Boundary Scan Description Language) files for these devices. BSDL files must be made available by the silicon vendor for a device to be compliant with IEEE Std. 1149.1. Is JTAG test just used in production? Not at all. 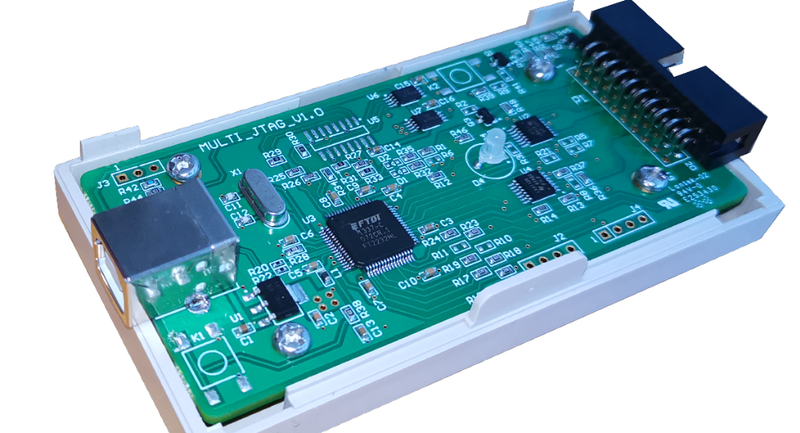 One of the key benefits to boundary scan testing is that the only test hardware required is a JTAG controller. Other production test technologies such as flying probe, automated optical/X-ray inspection or bed-of-nails all require specialised test equipment that will not be available on an engineer’s bench. Using boundary scan during board bring-up can remove uncertainties – hardware engineers can test prototype boards for manufacturing defects before system testing, and even before firmware is complete. Test systems developed at this early stage of the product lifecycle can easily be reused, and extended for production. A JTAG interface is a special interface added to a chip. Depending on the version of JTAG, two, four, or five pins are added. The four and five pin interfaces are designed so that multiple chips on a board can have their JTAG lines daisy-chained together if specific conditions are met. The two pin interface is designed so that multiple chips can be connected in a star topology. In either case a test probe need only connect to a single "JTAG port" to have access to all chips on a circuit board. The TRST pin is an optional active-low reset to the test logic, usually asynchronous, but sometimes synchronous, depending on the chip. If the pin is not available, the test logic can be reset by switching to the reset state synchronously, using TCK and TMS. Note that resetting test logic doesn't necessarily imply resetting anything else. There are generally some processor-specific JTAG operations which can reset all or part of the chip being debugged. Since only one data line is available, the protocol is serial. The clock input is at the TCK pin. One bit of data is transferred in from TDI, and out to TDO per TCK rising clock edge. Different instructions can be loaded. Instructions for typical ICs might read the chip ID, sample input pins, drive (or float) output pins, manipulate chip functions, or bypass (pipe TDI to TDO to logically shorten chains of multiple chips). As with any clocked signal, data presented to TDI must be valid for some chip-specific Setup time before and Hold time after the relevant (here, rising) clock edge. TDO data is valid for some chip-specific time after the falling edge of TCK. The maximum operating frequency of TCK varies depending on all chips in the chain (the lowest speed must be used), but it is typically 10-100 MHz (100-10 ns per bit). Also TCK frequencies depend on board layout and JTAG adapter capabilities and state. One chip might have a 40 MHz JTAG clock, but only if it is using a 200 MHz clock for non-JTAG operations; and it might need to use a much slower clock when it is in a low power mode. Accordingly, some JTAG adapters have adaptive clocking using an RTCK (Return TCK) signal. Faster TCK frequencies are most useful when JTAG is used to transfer lots of data, such as when storing a program executable into flash memory. Clocking changes on TMS steps through a standardized JTAG state machine. The JTAG state machine can reset, access an instruction register, or access data selected by the instruction register. JTAG platforms often add signals to the handful defined by the IEEE 1149.1 specification. A System Reset (SRST) signal is quite common, letting debuggers reset the whole system, not just the parts with JTAG support. Sometimes there are event signals used to trigger activity by the host or by the device being monitored through JTAG; or, perhaps, additional control lines. Even though few consumer products provide an explicit JTAG port connector, the connections are often available on the printed circuit board as a remnant from development prototyping and/or production. When exploited, these connections often provide the most viable means for reverse engineering. ARM architecture processors come with JTAG support, sometimes supporting a two-wire "SWD" variant or high speed tracing of traffic on instruction or data busses. Modern 8-bit and 16-bit microcontroller chips, such as Atmel AVR and TI MSP430 chips, support JTAG programming and debugging. However, the very smallest chips may not have enough pins to spare (and thus tend to rely on proprietary single-wire programming interfaces); if the pin count is over 32, there is probably a JTAG option. Almost all FPGAs and CPLDs used today can be programmed via a JTAG port. A Standard Test and Programming Language is defined by JEDEC standard JESD-71 for JTAG programming of PLD's. Intel Core, Xeon, Atom, and Quark processors all support JTAG probe mode with Intel specific extensions of JTAG using the so-called 60-pin eXtended Debug Port [XDP]. Additionally the Quark processor supports more traditional 10-pin connectors. Consumer products such as networking appliances and satellite television integrated receiver/decoders often use microprocessors which support JTAG, providing an alternate means to reload firmware if the existing bootloader has been corrupted in some manner. 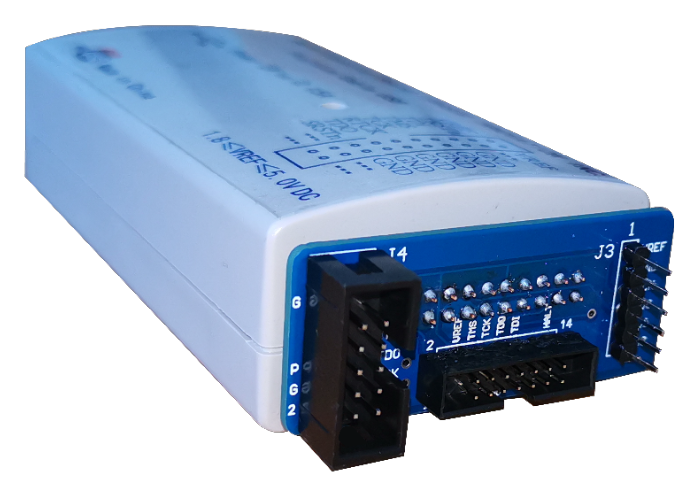 The PCI bus connector standard contains optional JTAG signals on pins 1-5; PCI Express contains JTAG signals on pins 5-9. A special JTAG card can be used to reflash a corrupt BIOS. Boundary scan testing and in-system (device) programming applications are sometimes programmed using the Serial Vector Format, a textual representation of JTAG operations using a simple syntax. Other programming formats include 'JAM' and STAPL plus more recently the IEEE Std. 1532 defined format 'ISC' (short for In-System Configuration). ISC format is used in conjunction with enhanced BSDL models for programmable logic devices (i.e. FPGAs and CPLDs) that include addition ISC_<operation> instructions in addition to the basic bare minimum IEEE 1149.1 instructions. FPGA programming tools from Xilinx, Altera, Lattice, Cypress, Actel, etc. typically are able to export such files. As mentioned, many boards include JTAG connectors, or just pads, to support manufacturing operations, where boundary scan testing helps verify board quality (identifying bad solder joints, etc.) and to initialize flash memory or FPGAs. JTAG can also support field updates and troubleshooting. There are no official standards for JTAG adapter physical connectors. Development boards usually include a header to support preferred development tools; in some cases they include multiple such headers, because they need to support multiple such tools. For example, a microcontroller, FPGA, and ARM application processor rarely shares tools, so a development board using all of those components might have three or more headers. Production boards may omit the headers, or when space is limited may provide JTAG signal access using test points. Those connectors tend to include more than just the four standardized signals (TMS, TCK, TDI, TDO). Usually reset signals are provided, one or both of TRST (TAP reset) and SRST (system reset). The connector usually provides the board-under-test's logic supply voltage so that the JTAG adapters use the appropriate logic levels. The board voltage may also serve as a "board present" debugger input. Other event input or output signals may be provided, or general purpose I/O (GPIO) lines, to support more complex debugging architectures. Higher end products frequently use dense connectors (frequently 38-pin MICTOR connectors) to support high-speed tracing in conjunction with JTAG operations. A recent trend is to have development boards integrate a USB interface to JTAG, where a second channel is used for a serial port. 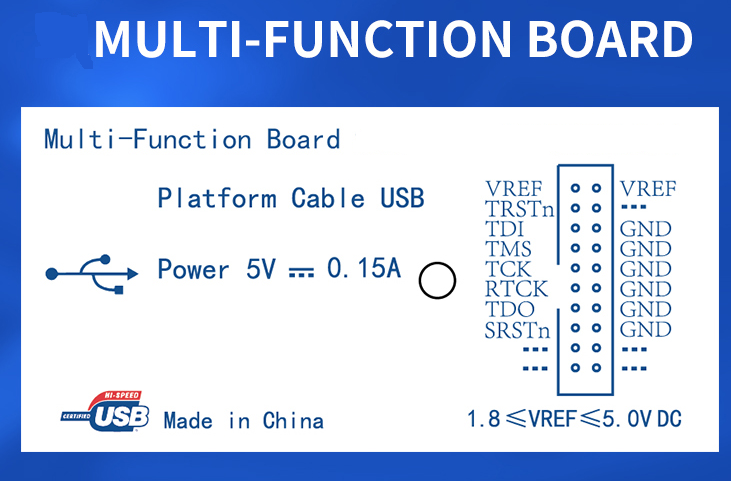 (Smaller boards can also be powered through USB. Since modern PCs tend to omit serial ports, such integrated debug links can significantly reduce clutter for developers.) Production boards often rely on bed-of-nails connections to test points for testing and programming.